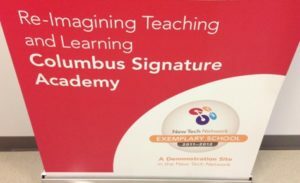 Yesterday a group of us from CTL visited the Columbus Signature Academy (CSA) in Indiana. CSA is part of the New Tech Network of schools that are organized around project-based learning principles, one-to-one use of technology, and culture of collaboration and flexibility modeled after an office environment. There were many things that impressed us, but for this blog post I want to focus on what this unique school does to ensure that students graduate from high school ready for college. I think there are some lessons we can all learn from, even in schools that don’t have a STEM focus or aren’t organized in the same way as CSA. The 9-12 Academy requires that all students complete a pre-college curriculum. The courses are often taught in an integrated fashion, such as Biology and English, called BioLit, so that students draw upon a variety of skills to learn new content. The seniors we talked with were taking calculus and engineering courses, as the school has a STEM focus, and had opportunities to intern in local businesses where they could apply their science, technology, engineering and math knowledge. Moreover, CSA requires its students to complete 12 units of dual credit courses, so that they enter college with a semester or more of credit. One of the seniors we talked with will have earned 30 college credits by the end of this year, some taken at CSA and some on a nearby college campus. College knowledge is embedded in the instructional approach adopted by the school, namely, project-based learning. Students work in self-directed teams to investigate topics, solve problems and create collaborative work products which are often judged by community partners as to whether they meet standards. In this approach students learn to work independently from their teachers, collaborate with others, set goals and monitor their own project completion. Some of this work is done in class, and at other times students collaborate in work areas like the booth pictured above or in other flexible seating arrangements outside of class, where they have access to a teacher for help but for the most part work on their own. Moreover, in launching a new collaborative project, students spend time establishing what they know and what they want to know, so that their research and task completion have meaning and purpose. The routine of spelling out what you know and need to know are shown on the picture of the white board with its sticky notes written by students before they launch a new project. Students are also taught how to intervene with peers who are not completing their share of the tasks, and do so in way that is respectful and results in a better peer relationship. All of these skills and experiences are essential to success in college and beyond, and the New Tech Network draws on the work of David Conley and others in ensuring that students develop the necessary capacities for time management, goal setting, content mastery and self-monitoring. In fact, the School-Wide Learning Outcomes described for students in rubric form emphasize for grades 9-10 content, written and oral communication, collaboration and work ethic; and for grades 11-12 content mastery, critical thinking, technical proficiency, interpersonal skills, citizenship and ethics. In talking with principal Mike Reed, the role of school leadership in building and sustaining a culture of trust, respect and responsibility emerged as a critical one. While the school has a relaxed atmosphere with no bells, open spaces and lots of freedom of movement, there is also an intensity of focus on student academic achievement and personal growth. Mr. Reed takes seriously the challenging of ensuring that each student succeeds and graduates from high school ready for college. As a new school, CSA has had only one graduating class whose members he invited back recently to talk with current students. However, the strong academic requirements including a senior project and senior internship, and Mr. Reed’s emphasis on empowering and engaging students, point to a graduating class that is prepared for college and eager to continue learning. 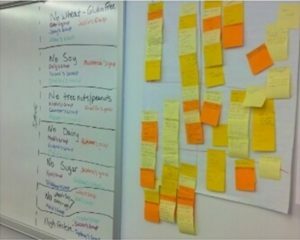 Schools can post on white boards/bulletin boards the calendar for college readiness activities each year grades 9-12, so that students are continually reminded of the goal and how to get there. Classroom instruction can emphasize collaborative work for students as well as real world applications, perhaps not on all assignments but as a regular alternative to lecture and direct instruction. This can contribute to student college readiness. Schools can partner with a local business to 1) assess the quality of student work products that grow out of collaborative projects, and 2) provide opportunities for student internships where they apply what they are learning in the STEM fields to real tasks, strengthening their college preparation. 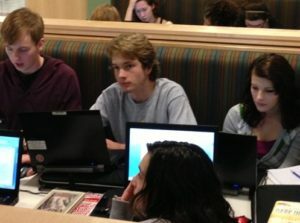 Schools can create within their existing facilities spaces for students to collaborate and do independent research, two skill sets students need for college and career. Going back to project-based learning, students could be charged with working out low cost solutions to creating more flexible space by doing research and consulting with local businesses. Finally, at both the classroom and school level, teachers and administrators can think differently about how to use existing technology, both computers and notebooks and well as students’ smart phones, to give students greater access to digital resources. Current students will most likely use online textbooks, communicate with their professors and submit their assignments electronically, and be expected to use digital resources in their college coursework. This entry was posted in Blog and tagged culture, Instruction, project based learning, reform. Bookmark the permalink.